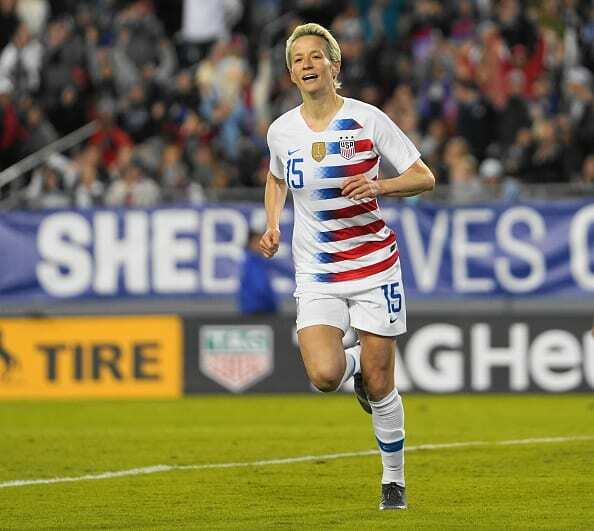 Megan Rapinoe of The United States scores a goal, which gets cancelled because of offisde during the SheBelieves Cup match between The United States and Brazil at Raymond James Stadium on March 5, 2019 in Tampa, Florida, United States. On the return episode of Soccer 2 the MAX, Sean Garmer, Erik Watkins, and Rachael McKriger discuss the latest in America’s beautiful game. Should alarm bells being going off for Frank DeBoer already in Atlanta? Who’s had the better run so far? Seattle Sounders, Minnesota United, or LAFC? Has Ben Olsen finally figured it out for D.C. United? And can New York City FC do anything about the poor state of Yankees Stadium? These are just some of the things discussed here. Don’t let height fool you. Before becoming a journalist, Rachael McKriger was a goalkeeper. Yes, all 5-feet-two-inches of her. Now, don’t ask if she was good or not because that answer is up for debate. Currently, she doesn’t play soccer anymore, unless it’s a pickup game in the park or at her former high school. However, she’s still closely attached to the sport. Rachael covers the U.S. Men’s and Women’s National Teams. The MLS and NWSL for Last Word on Soccer as an Editor. She loves football with an undying passion. Yes, she calls it football, since she hails from Europe (the colder part, aka Moscow). Rachael’s favorite clubs are Borussia Monchengladbach in Germany, the Seattle Sounders in MLS, the Washington Spirit in the NWSL and the U.S. National Teams.